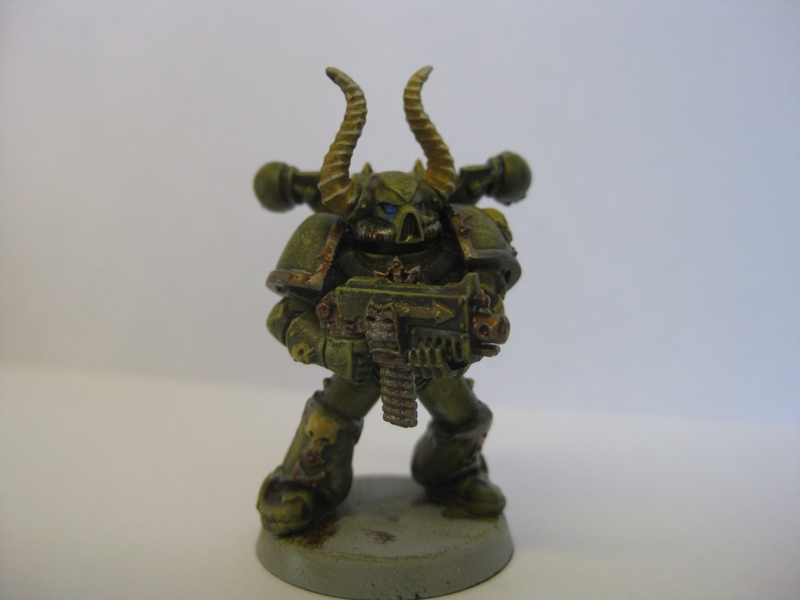 It really isn’t the best picture, but here is (I think) the fifth test model I’ve done trying to get a white paint scheme for my upcoming Plague Marines. I think I’m finally heading in the right direction with this one. I applied a wash mixture of Secret Weapon’s Baby Poop, Sewage Water, and a matt medium in a 3.3.3 mixture. Afterwards I felt the wash was a bit too yellow, so I tried to clean it up with a makeup applicator and some alcohol. This is the final result. Again, the picture doesn’t do a great job. The miniature’s armor did come back to a white color, but I’ve decided to strip it and try again with a slightly different method. The next test run I’m going to do much the same except I’m going to do a more brown/sepia wash. I’ll seal that, and do some dry-brushing to bring the white back up a bit. I’ll then do another wash with probably the Sewage Water since it’s a more “pukey” green color. This color scheme is providing a number of challenges that I want pass. The fact is that white is already a tricky color to get right. 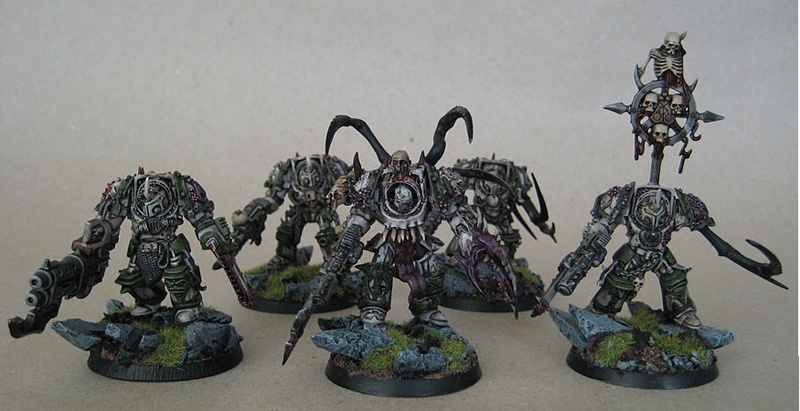 Add to that the contrary nature of making white (a sort of clean color) and the ideas of a Plague Marine (dirty, diseased, corroded), and one has a big order to fill. 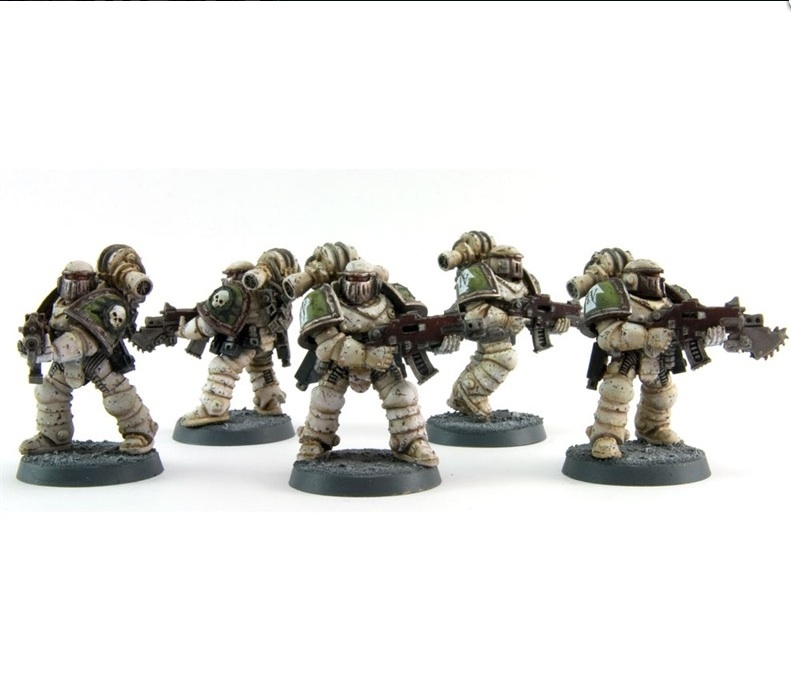 I also want to keep the white warm as this will be contrasted nicely with the greyish color tones I plan to you for the skin tones of my marines and daemon engines as well as the dark, cool tones I plan to use for the actual green of the Death Guard. Thoughts, tips, trick, and comments are certainly welcomed. I usual think through a problem better when I talk about it. A quick update: While my miniature was sitting in its stripping solution, I got out some of my washes and just did a test pallet of them with out mixing them. You can see the results above. I can see that Baby Poop, while is befitting the legions of Nurgle, will not be a wash I use as it is what keeps yellowing my white. The colors that have caught my attention are the Sewage Water, the Green Black, and the browns and flesh washes that are to the left. 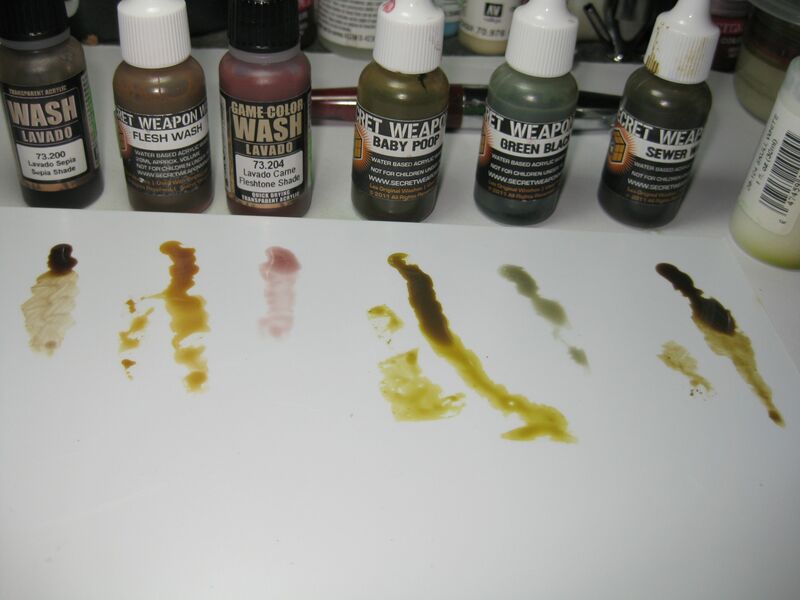 I can mix the Secret Weapons’ Flesh Wash with the Vallejo Fleshtone to get a nice sepia. The Sewage Water is a good brown/green mixture, but it’s the Green Black that has my attention. 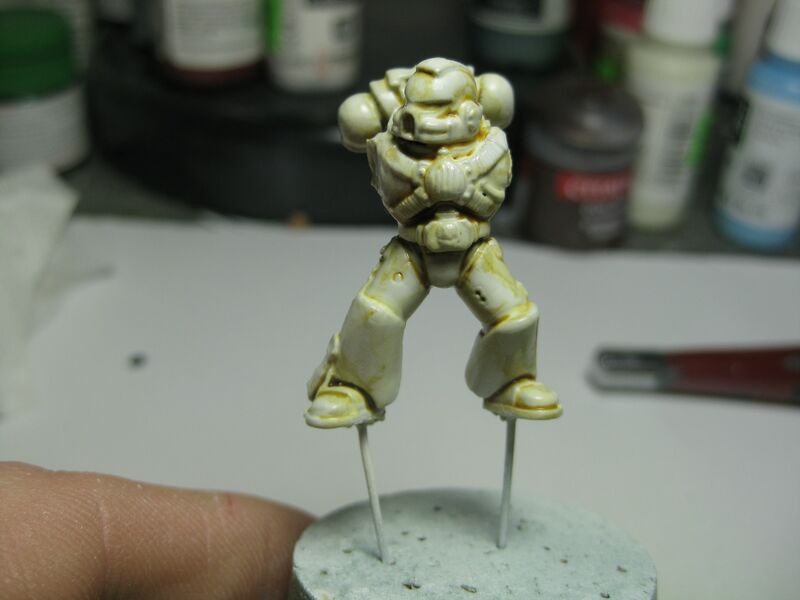 I believe that I can get a good sutdel green stain/shadow using it and do an oil wash of brown when the model is done. I certainly would like to hear what others think. 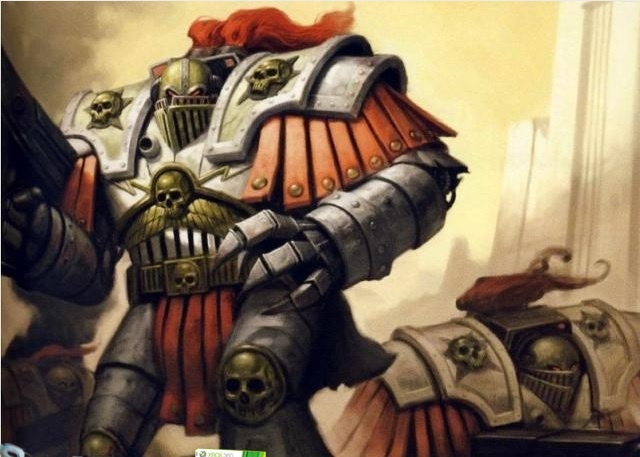 Edit note: I was able to find the Forgeworld Pre-heresy Painting Guide later today. I’ll gather the supplies and see how I do. Though I have to try and figure out by what they mean by high light: is it a line high light, layer high light, dry brush high light. I’m also going to try and find color matches in the Vallejo range since they are easy to mix and easier to thin. The best way I can describe it is that it is the color of unpainted, untreated metal. 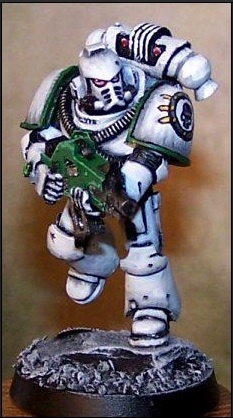 Obviously, white does not fit that idea, picture, or description, and frankly, I don’t want and don’t like to paint white armor. I will be honest and tell you that I do like this color. 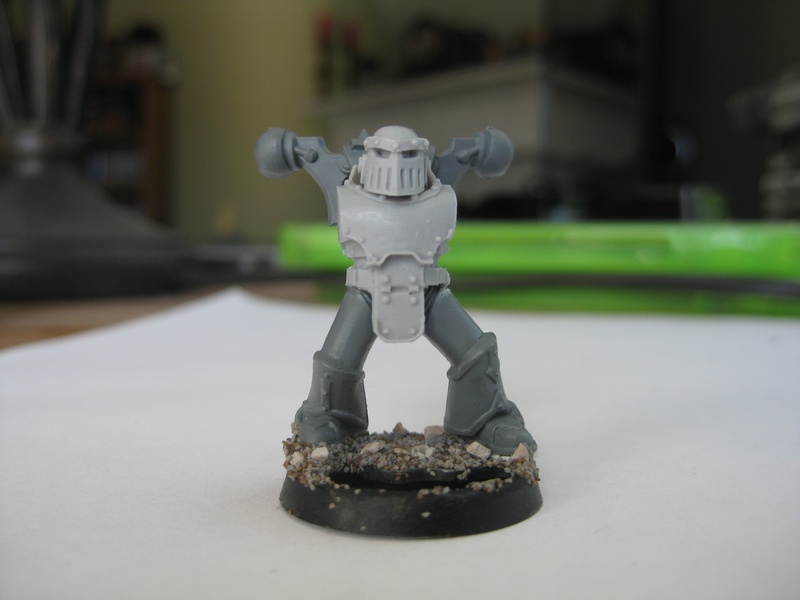 It gives the model and therefore the army a bit more character than just plan grey or white. It also compliments the green a lot better and makes it stand out more. As a result of this wondering and thinking, I decided to create two test models. 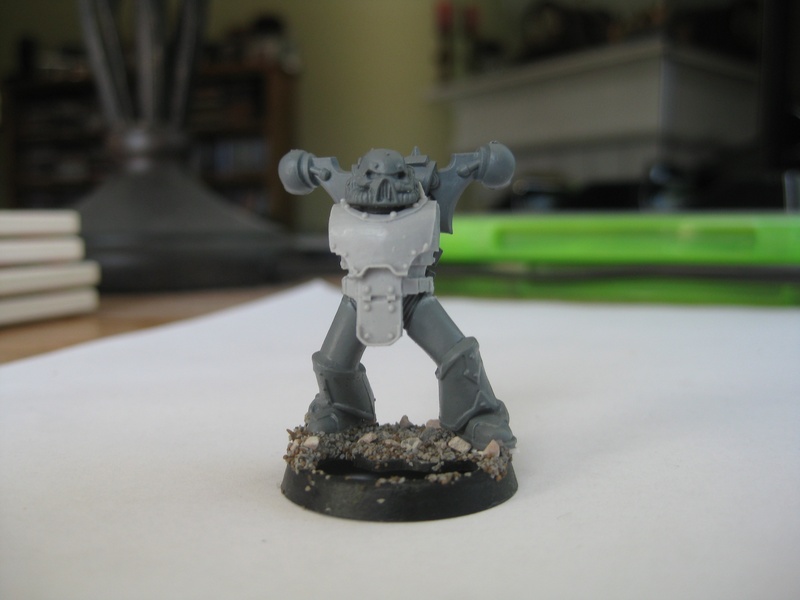 One in the traditional and fluffy style of grey, and the other in the Forgeworld cream style. This is what I got. I’ll start by saying that my lighting is not great. I do not own a “true light” light or whatever you call the lights that are true white lights. My personal thoughts on the models are that they came out not too bad. 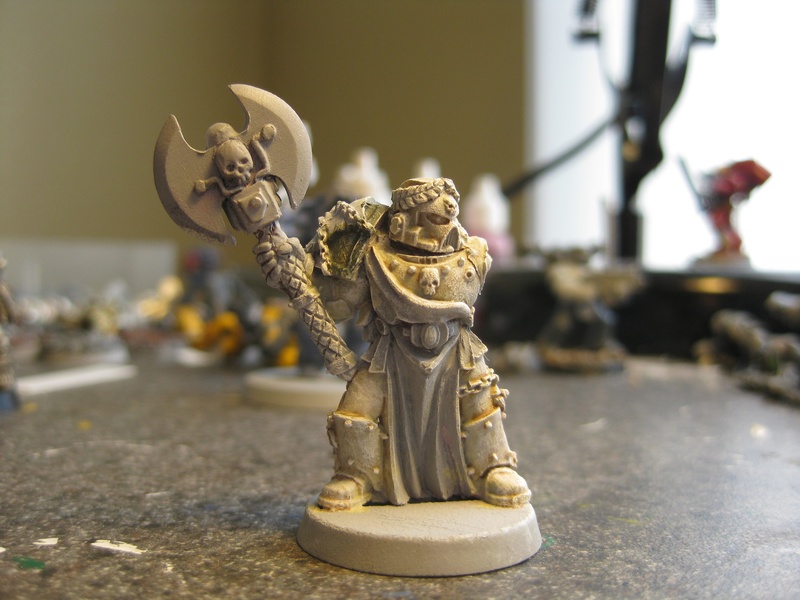 For the cream model, I feel like it doesn’t match what Forgeworld did. Either do a few more layers of light dry brushing with the white, or I’m just using the wrong color combinations and methods. 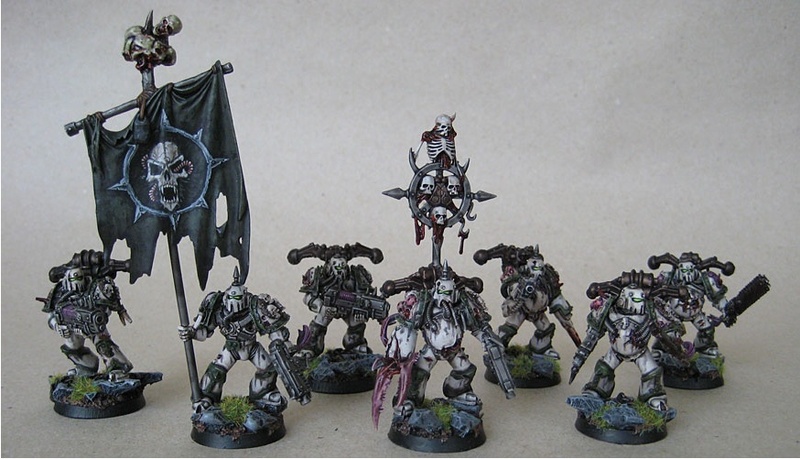 The green I think I went too dark, and is probably not a match for what is used for Death Guard. I started with GW’s Catachan Geen/Vallejo Olive Grey and did a quick dry brush of Vallejo Olive Green. In the end, I’m feeling like it looks too much like Deathwing. The grey model was simple, but seems to be lacking something. Perhaps I could have done another dry brush of a lighter shade before doing high lighting with the white. 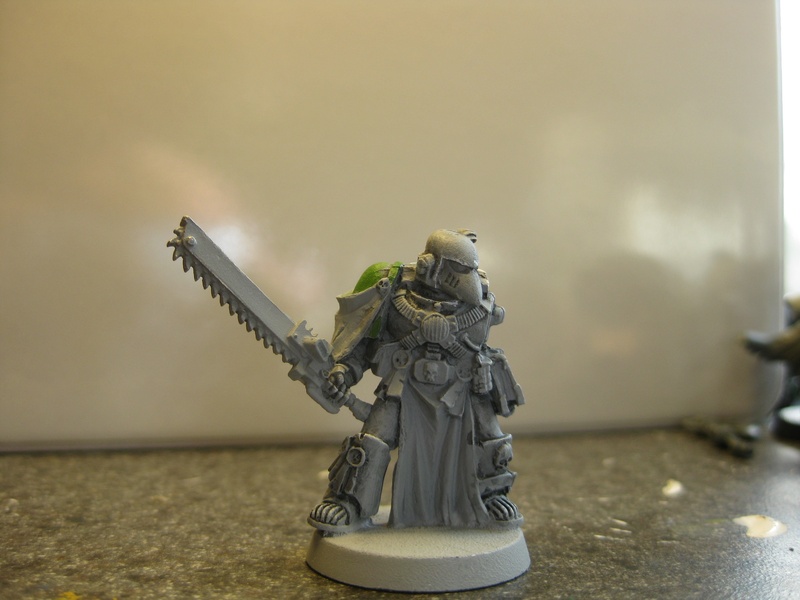 Also, I think the green is too light with this model. I’m sure things would look different if I actually finished both models, but I wanted to get an idea for armor color first since that what you see the most. I would love any thoughts, comments, criticism, and tips. Let me know which one you like best.